Team PokerStars Pro Jason Mercier took down the Seminole Hard Rock High Roller in Florida last week. Mercier beat Justin Bonomo to take home yet another title and $794,600. The Deal jackpot has hit seven times over the past five weeks, resulting in a total of $520,505.88 being awarded to jackpot winners. Ramin Khorshidi from Hampshire, United Kingdom won a prize of $54,029.07; resulting in 25,231 players winning a $2.14 pay-out. Ramin said: “I've never won anything before, and I’m totally blown away by my big win!” He plans to celebrate by planning a trip to a live poker event and buying his wife a new car. First prize won by Elliot Smith in the PokerStars Championship Macau Main Event. Smith beat a field of 536 players to claim the trophy and the largest payout from the HK$20,796,800 prize pool. Brazilian poker player ‘EVitoy’ earned $136,000.12 in the PokerStars Sunday Million after beating a field of 5,743 players. The total prize pool was a guarantee–beating $1,148,600. The second freeroll, which kicks off this Sunday, will be hosted by Team PokerStars Pro Bertrand ‘ElkY’ Grospellier on PokerStars.fr – registration is open now. Prizes up for grabs are a PokerStars Championship Monte Carlo Main Event package, a PokerStars Championship Monte Carlo National package, and €100 satellite tickets. Players can also qualify for the PokerStars Championship Monte Carlo Main Event and National Championship via satellites starting from as little as €2.20, currently running on PokerStars. PokerStars Championship Presented by Monte-Carlo Casino®, which features 71 scheduled tournaments, takes place from April 25 – May 5 at the Monte Carlo Bay Hotel & Resort. Check in with PokerStars Blog for live updates throughout. Due to popular demand, exclusive $8 PokerStars Championship Sochi Spin & Go tournaments are back, giving players the chance to win more Main Event packages. Players can also qualify for the PokerStars Championship Sochi Main Event and PokerStars National Championship through a range of satellites currently running. High school teacher, Sosia Jiang, won the PokerStars Championship Macau High Roller for HK$3.87 million. The large payday vaulted her to the top ten on New Zealand's all-time money list. 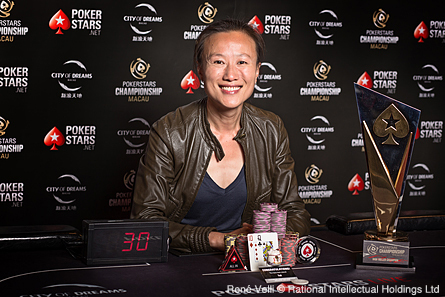 Jiang is the first female player to win a PokerStars Championship event, and the first woman to lift the High Roller trophy at a major PokerStars sponsored tour since Team PokerStars Pro Vanessa Selbst's victory at PCA 2013.